The taxi industry has been preoccupied with ‘threat’ for too long. At iCabbi we want to change the conversation to ‘opportunity’. Why? Because we believe that taxi companies can take a stronghold in the future of mobility. We see opportunity in abundance. We want to explore why and how taxi fleets can grow in the Mobility as a Service age by looking into developments and innovations within the industry. So, we’re launching a brand new magazine for the global taxi industry to do just that - and I’ll be documenting the journey of this new taxi magazine from inception through to launch right here. It’s no small task to get something like this off the ground - and it certainly won't happen overnight. Indeed, more than a few nights have passed since this objective was first dreamed up. As a leading provider of taxi dispatch technology, and therefore tied to the business of commercial vehicles, Under the Hood was a perfectly suitable name for iCabbi’s first employee newsletter. Thing is - it didn’t stay under the hood for long. 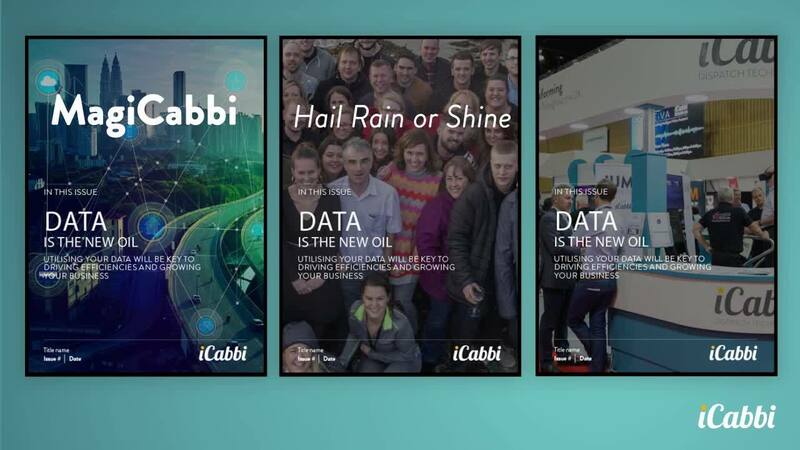 The content being produced for the newsletter was pretty damn good and so one of iCabbi’s bright sparks (we’ve got lots of them) decided to polish it up another notch into a print magazine that would also be distributed to iCabbi customers and relevant parties in the taxi industry. Under the Hood got better and better with each issue, but there was one thing amiss. Because the magazine now targeted two distinct groups - inside and outside iCabbi - neither were being thoroughly serviced. By this I mean that the iCabbi folk lost out on the kind of in-house indulgences that no one else but us would care about - the birthday shoutouts, sensational night out photos and the odd bit of tongue in cheek slander. Likewise, outsiders interested in the wider trends and developments in taxi innovation were probably getting one spoon too much iCabbi sugar. A dilemma for sure. Meanwhile, a major change was afoot. In a landmark move for the taxi industry, iCabbi negotiated a strategic partnership with RCI Bank & Services in June 2018. Group Renault backing enables us to grow our Dublin HQ into a global taxi innovation centre, with 120 jobs being created here over the next 3 years. Here’s where I join the story. I came on-board with iCabbi in September of 2018 to lead content, including the fate of Under the Hood. With additional resources, the vision of putting taxi companies at the center of mobility, and a robust iCabbi 2.0 strategy and vision. We made the decision to launch a magazine brand that would capture and inspire the developments and innovations shaping the future of the taxi industry. This magazine, we agreed, would be the voice of a community actively transforming the traditional taxi business to prosper in a new age of transport. Boom! What a great idea. Now, we’ve got to materialise it. So, as the newly appointed Editor, I quickly set about putting in place what every editor needs, a cigar in my mouth. OK, no, I’m talking about an editorial board. Quality, objective content and reporting are at the heart of what we intend for this magazine. And of course, the other thing we need, quite pressingly, is a name! Under the Hood isn’t going to cut it for a publication that has as much to do with technology and urban mobility trends as it does with traditional vehicles and taxi fleet models. Since we want this magazine to be a voice for the taxi industry in this new age of transport we decided to throw out a challenge to our future subscribers to help us name the brand. So far we’ve had tons of entries - no doubt helped by the fact that every entry gets entered into our draw to win a trip for 2 to visit iCabbi HQ in Dublin. Here are some of the title suggestions we've had so far. But is the perfect name still out there? There are a couple of days left to enter, so why not throw your suggestion into the mix. Watch this space for the winning name and the continuing story of this new media adventure!